... to Intense, the approved fanlisting dedicated to brown eyes! This fanlisting was created on March 27th, 2009 by Kelly and previously owned by Jessica, Lisa, Quirino, and Mary. Disclaimer: This website is neither authorized nor is it official. No copyright infringement is intended. This fanlisting was last updated on 29th March 2019 and currently has 230 approved fans with 0 waiting to be added. Please give a warm welcome to Christy. An enormous thank you and lots of cuppycakes to Mary for allowing me to adopt this major wishlister from her. 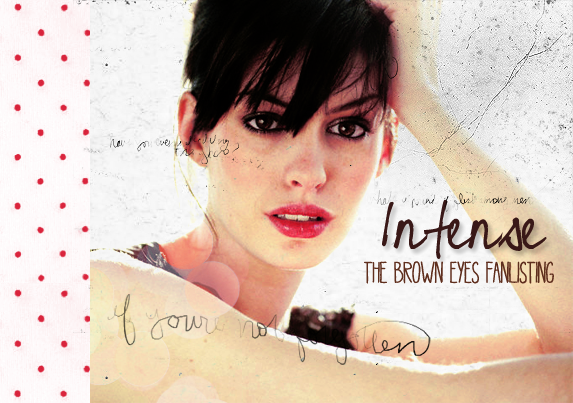 *bounces* And who better to show off her beautiful browns than the ever-wonderful Anne Hathaway! � 2009 Kelly | &;heart | Midnight falls, and wishes come alive.